Crypto investors generally do two things, i.e., Buy & Sell. They sell when the price is high and buy when the price is low. However, many investors miss-time their buy and sell due to FOMO. But don’t you think there should be more to your cryptoassets. I mean avenues to do more with your digital currencies like Bitcoin, Ethereum, etc. For example, lending and borrowing cryptocurrencies !! And the good news is, it is no longer a hypothetical example. Now you can lend and borrow your cryptocurrencies apart from buying/selling them. Borrowing and lending crypto have several benefits which we have discussed in our previous article on crypto loans. Moreover, in real life, there are some who don’t want to sell their assets but are forced to do so because of lack of options. For such individuals crypto loans are perfect. 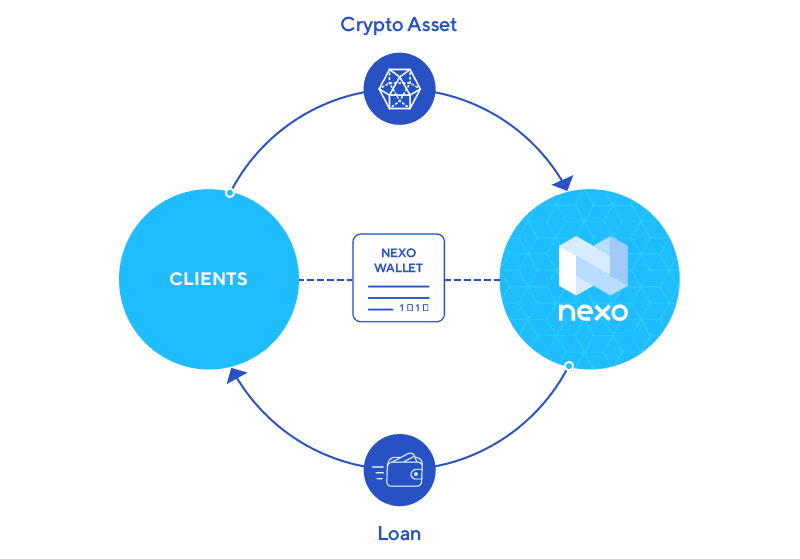 Nexo Lending platform is a blockchain based platform that provides crypto backed loans to its customers. These Nexo loans can be availed by keeping your cryptocurrencies as collateral with the Nexo platform. 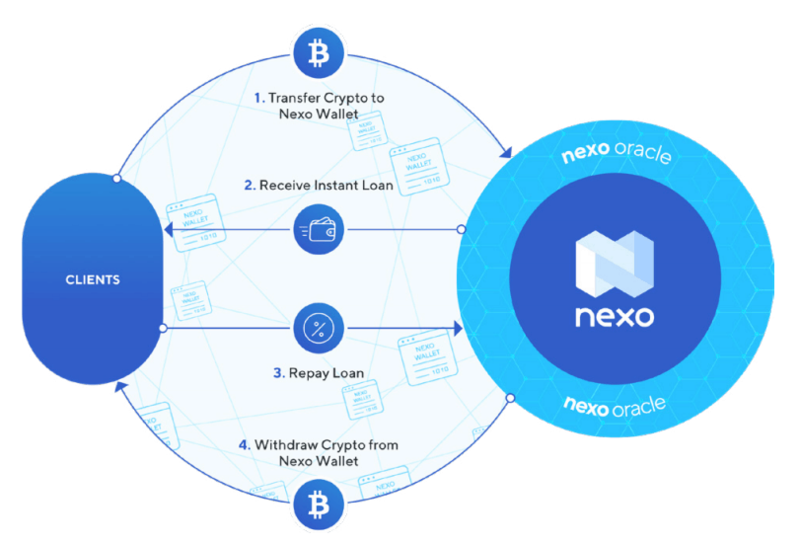 That’s why Nexo lending is also known as the instant crypto line of credit where one can get extra cash in USD or EUR without having to relinquish their ownership of cryptocurrencies at the same time. This way the crypto loan borrower gets the much-needed liquidity for the cryptoassets which he/she doesn’t want to sell at the same time keeping the right to claim back his crypto collateral as it might be worth even more in the future. 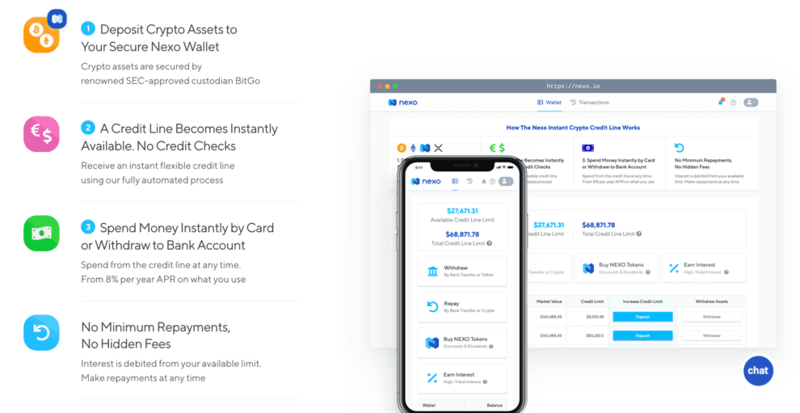 How Does Nexo Loan Work? The way Nexo loans work is pretty straightforward and easy to understand than the traditional lending cycles. Moreover, almost all critical parts of the platform are automated through blockchain based smart contracts, so you need not worry about human errors. So here are four high-level steps when you are taking a loan through Nexo. Register on Nexo and get rid of your KYC quickly. Once that is done, transfer your crypto collaterals to the Nexo wallet and wait untill the collateral coins are confirmed on the blockchain. Once the collateral is confirmed on the blockchain, Nexo oracle evaluate your collateral quality and value of it determined the appropriate LTV for you. After the LTV is calculated, you can receive your funds directly in fiat to your bank account or in a stable coin. For example, your LTV as suggested by Nexo is 50% and the total worth of your collateral is $10,000 then you can receive a loan up to $5000. Repayment of the loan is quite flexible in Nexo as you are not required to do monthly repayment untill your outstanding balance is less than the loan limit. Also, you can avail a 50% discount on the interest rate if your collateral or repayment is in Nexo tokens. You can repay all or part of your loan at any time by bank transfer or using crypto, including the assets deposited in your Nexo Wallet. Once you have repaid your full loan amount along with interest, you can easily withdraw your crypto collaterals from the Nexo wallet to another wallet in your control. How to Get an Instant Crypto Loan from Nexo? Now that you know everything about Nexo loans and the company, its time that we discuss briefly how to get instant crypto backed loan from Nexo? Firstly, register and login to Nexo. Complete your basic KYC to get loans up to $10,000 — complete detailed KYC by submitting relevant photo ID proofs to get loans up to $2 million. Once KYC complete, deposit your cryptoassets to Nexo wallet against which you want to take the loan. For example, deposit BTC, ETH, XRP, etc. Now once these deposits are confirmed on the blockchain go to the ‘withdraw loan’ section, and you will see the loan limit available to you as per your deposited collateral. Which Collateral Coins Nexo Accepts? As of now, the Nexo platform accepts seven cryptocurrencies as collateral, and they are namely, BTC, ETH, XRP, NEXO, BNB, LTC, Stablecoins. Of course, there are plans to add new coins and tokens that can act as collateral. Currently, the voting for new coins to be added is going on here, and only NEXO token holders can vote for it. There are some more exclusive features of Nexo loans that makes it an ideal choice for taking crypto backed loans. We are going to discuss that in our next section on why to choose Nexo for crypto loans? Why Choose Nexo For Crypto Backed Loans? Nexo is a subsidiary of Credissimo, which is a leading fintech group serving millions of people across Europe for over 10 years. This is the main reason to trust Nexo as it is backed by an experienced company that has been in the lending business for over ten years. Moreover, in just seven months of its launch, Nexo has established itself as the world’s leading crypto lending service and has processed more than $300 million to a growing user base that at present exceeds 170,000. And so far there has been no breach or significant defaults on the crypto loans through Nexo lending platform because the loans are generally overcollateralized which automatically factors-in the wild volatility of crypto markets. Nexo also has the largest network. It is the most advanced and trusted instant crypto lending provider on a global scale, servicing 45+ currencies across more than 200 jurisdictions. 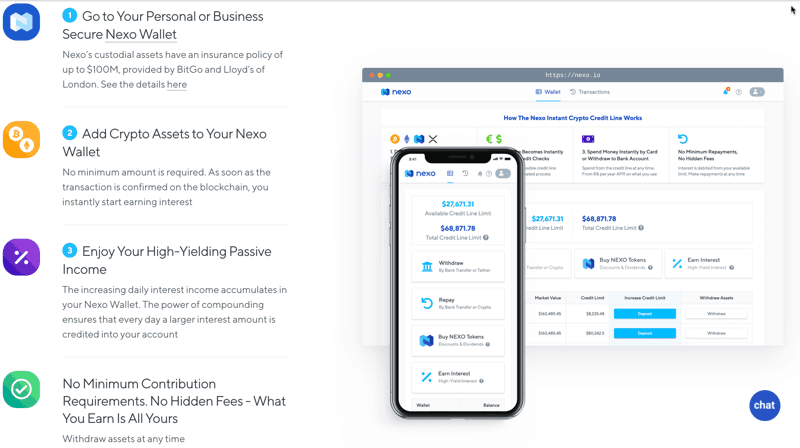 Nexo lending platform also provides dividends to the Nexo token holder, and for lenders, it offers interest rates up to 6.5% which is 2-3 times higher than the traditional savings account interest. Through the Nexo platform, the lenders can earn interest on their stablecoins. Deposit stablecoins like DAI, PAX, USDC, USDT & TUSD on Nexo platform to earn 6.5% p.a. Compounding interest paid out daily. This process is fully automated and is available for all Nexo Wallets with no minimum amounts & no fees restrictions. Last but on least these deposits are insured up to $100M and even more, assets are coming soon to help you earn interest on your cryptoassets. So because of all these reasons, Nexo is an excellent platform to avail your crypto loans, and that’s all from our side in today’s review of Nexo.io platform. If you are someone who has used this platform already? Then do share your experience with us and if you haven’t check Nexo out then do so as the registrations might close due increase in popularity of crypto backed loans ! !